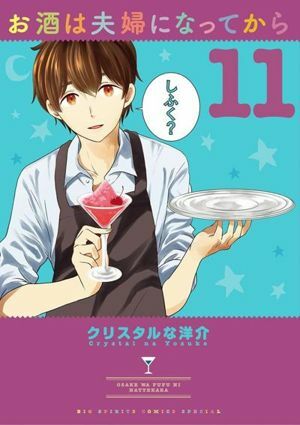 On Friday, Osake wa Fuufu ni Natte kara’s 11th volume revealed that the manga series is coming to end. The manga will end with the 12th volume and will be released on September 12, 2019. The manga follows the story of Chisato Mizusawa who is reserved but an excellent assistant manager in her company. But she has a secret which only her husband knows which is that she likes drinking alcohol. Every night her husband, Sora makes her a cocktail to get relaxed and drunk. Osake wa Fuufu ni Natte kara (Love is Like a Cocktail) is a web manga series written and illustrated by Crystal na Yousuke. The web manga debuted on Shogakukan’s Yawaraka Spirits. a free manga website on April 3, 2015. The individual chapters of the manga are compiled into tankōbon volumes by Shogakukan under its Big Spirits Comic Special label. The manga was also adapted into a 13 episode anime shorts by studio Creators in Pack which premiered in October 2017. The Blu-ray Disc for the anime series bundled an unaired 14th episode.